Detroit Vintage Coffee and Tea House: The Oasis in my Neighborhood! For over a year I rode past the eye catching storefront dressed with welcoming blinds. The thought of visiting this peculiar place would be lost by the recognition of the inner city’s fanfare. As a native from the “D” it is human nature to drive along Eight Mile Road and watch the countless liquor stores, and gas stations wave at the people and lure them into what they offer. In addition, there are the greetings of fast food chain restaurants that serve delicatessens dipped in fried grease with minimum priced meals. As time passed I continued to drive along Eight Mile forgetting to visit a new place I needed to discover. Days evolved into months and I couldn’t take it anymore. While driving in my car I blurted out loud, “I must visit Detroit Vintage! What does this place really have to offer in my hood?” I remembered a meeting of the minds was approaching for two board meetings regarding separate non-profits I belong to. 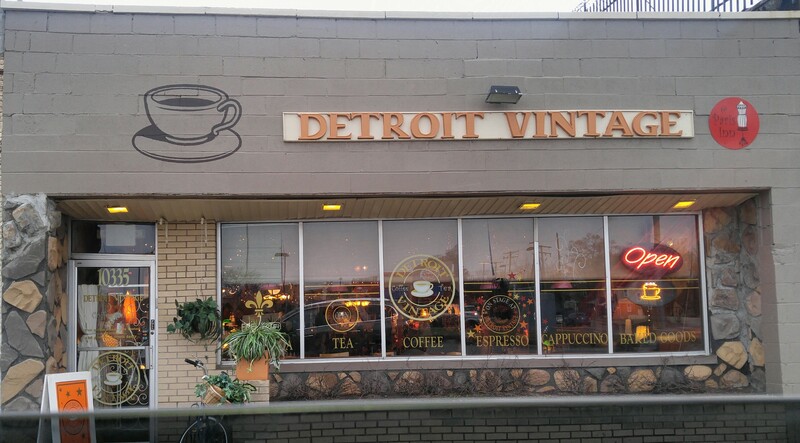 I told my friend, “Hey we must have our meetings at Detroit Vintage Coffee and Tea House.” Next, I sent an email indicating the meetings were to take place at Detroit Vintage before I had the opportunity to have it approved by the proprietor. I called the owner and she assured me the meetings could be held there. On Saturday, January 16, 2016 I woke up with excitement. I would be able to view what was behind those welcoming blinds. I started my day off early to meet the owner in person to confirm the board members could meet at Detroit Vintage. Once I arrived there was a kind woman sprinkling protective solution on the back walkway to ensure a safe path was available to patrons who wanted to know or already knew what was behind those welcoming blinds. I politely introduced myself and with a gleaming smile she informed me she was the owner. Pam Duvall was delighted our organizations would host our meetings there for the day. Three and a half hours later I would finally be able to sit within an oasis in the middle of the inner city. I arrived at 10335 W. Eight Mile Road between Meyers and Wyoming Roads. I was able to catch a glimpse of what would be in store from the back of the building where patrons have ample parking. Also, in the rear of the facility customers will find a restful place known as a patio to partake in for warmer days that would be approaching soon. The painted promises of hope on the building offered rays of bright sunshine even though snow was beneath my feet. It was time for the meeting and I was disappointed in myself. Matter of fact I was angry for waiting so long to stand in a wonderful space filled with endless treasures! My eyes spoke louder than my thoughts. Detroit Vintage offers new and used books for sale. If you are in the mood of welcoming new aromas to freshen your home you can purchase scented candles. If you are looking to sip a delight to warm the insides of your soul there are various choices of specialty teas, coffees or good ol’ fashioned hot chocolate to tinkle the fancy of your tummy. Panini sandwiches are available if you are interested in a light snack. In addition, you can purchase baked goods and sweet treats! The owner of Detroit Vintage didn’t select the location by happenstance. Duvall informed me Detroit Vintage was occupied by her family many decades ago. During that time it was a soul food restaurant. Though the business closed the building remained in the family. The facility was given a little love and the new vision known as Detroit Vintage was born. Unfortunately, Detroit Vintage only operates during the weekends. Duvall stated, “Growth is important, but it must be steady.” She is aware she is not prepared to serve 100 people at one time because it could lead to disaster. Duvall believes it is important for Detroit Vintage to remain a fun place where you can read a book or relax. I asked her to describe the setting of Detroit Vintage and she indicated, “It is a place where you can sit back and enjoy the comfort of being in someone else’s home.” In addition to offering delicious delights Open Mic Night is held every first Friday. Participants can be as young as ten or the heartfelt age of many years beyond. I must stress the material presented in the showcase should be sensitive to the ears because offensive language is intolerable. If this isn’t enough make sure you bring or find a competitive companion because there is a table of chess or checkers for you to play at your leisure. 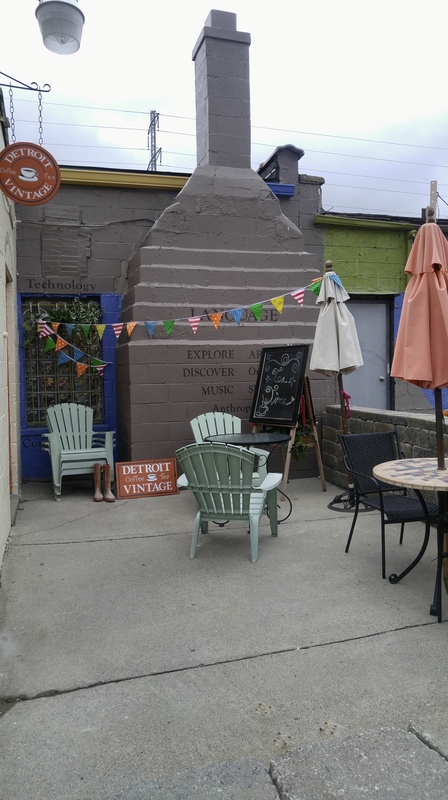 Detroit Vintage is an amazing, distinctive, and cozy place to visit. Duvall stressed the business is currently promoted via social media and word of mouth. I hope this story also serves as a promotional piece and inspires others to visit. There’s a sofa waiting for you to sip tea on fine china as you inhale the uniqueness that surrounds you. I was pleased with my decision to meet at Detroit Vintage. We had two successful meetings because the ambiance of creativity was in the atmosphere. Next postStarting a Heart Full of Conversations to Spark the Courageous Soul of Detroit! I’m so very proud of you lil’ sis!! Great job. I can feel the intensity of your feelings in your words. Love it. Thank You Sis!!!! I really appreciate your feedback!!! I’m going to check this place out maybe one Sunday after Church. I know I’ve passed this place several times. Maybe our picnic committee could meet up there have a cup of tea and a sandwich a short meeting. Yes!!!!! Please check it out!!!! Very nice article! Your words created wonderful visions in my mind. Thank You. Thank You Anita for taking the time to read this article! Hope you check it out for yourself! Thank You Hubby!!!! I appreciate your support!!!! !